Miao Diocese » North East Regional Bishops visit the Buddhist Monastery at Miao to promote inter-religious dialogue! Home » News & Events » North East Regional Bishops visit the Buddhist Monastery at Miao to promote inter-religious dialogue! North East Regional Bishops visit the Buddhist Monastery at Miao to promote inter-religious dialogue! The North East Regional Bishops who are in Miao for their annual gathering paid a visit to the Buddhist Monastery in Miao to promote inter-religious dialogue on 13th March 2015. The 14 Bishops of the seven States of North East India are in Miao for their Regional Council Meeting 2015 from 12 to 15 March 2015. On the second day of the event they paid an official visit to the famous Buddhist Monastery in Miao. Extending a very warm welcome to the prelates from North East region, Rev. 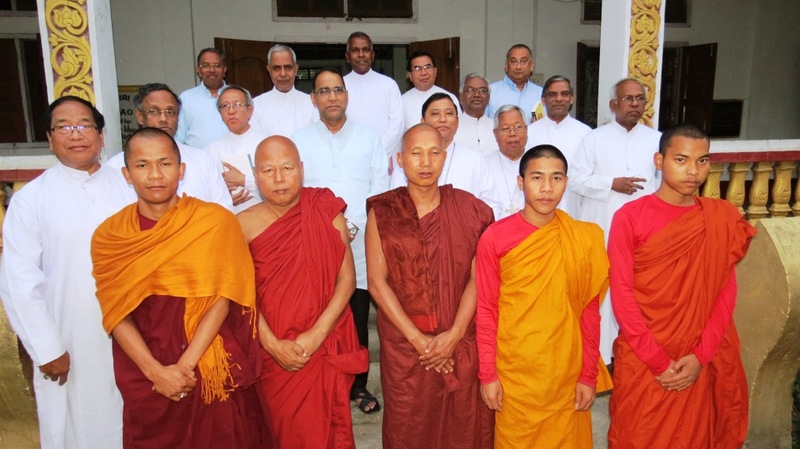 Narinda Bhikkhu Mahathero, the head monk at the Monastery expressed great joy having to host 14 Bishops on a short notice. “We need to stand together as children of the same God, especially in the wake of the rising number of attacks on religious institutions all over India”, he said. Appreciating the similarities that are there in Buddhism and Christianity, he said, “Non Violence and and Love for neighbours are fundamental to our religions and teachings on these two aspects are there in all religions. The world will be a better place to live in if we start appreciating the similarities and respect the differences”, he stressed. Bishop Thomas Pulloppillil of Bongaigaon Diocese thanked the Monk for the warm hospitality and said, “We feel at home with you as both of us are seeking God. Our coming together is very significant today as we can see a growing trend of religious intolerance in most part of our country. We shall stand together to promote religious harmony in this part of the Country. Bishop George of Miao Diocese, the host of this ongoing Regional Council Meeting 2015 thanked the Bishops and the monks at the Monastery for setting a perfect example of inter-religious Dialogue and religious harmony.